Over the past few years, 3D printing has slowly but surely been growing up. The quality of materials and printers has been getting better, more players have been entering the market, and the world at large is starting to take notice. The number of manufacturers on show at this year’s CES – often a good barometer which tech is going to be cool over the next 12 months – was impressive. Obviously 3D printing requires good 3D software. So it’s not surprising Autodesk are looking to get in on the action. Last year it announced its own 3D Printer and Spark, an accompanying software platform labelled the potential “Android of 3D Printing”. The company also announced the $100 million Spark Investment Fund to invest in the technology over the next few years. We talk to Aubrey Cattell, Senior Director of Business Development and Operations, about the nascent 3D printing industry and how Autodesk plan to be a part of that. How big is the current worldwide market for 3D printers, and how big could it be? This is an industry that’s both old and new. Additive manufacturing has been around for 25 years and in that time, only about 250,000 machines have been sold; half of which was within the last 12-18 months. That said, there’s tremendous opportunity in the industry. Studies predict the total market to grow from around $4 billion in 2014 to more than $16 billion in 2018. According to PriceWaterhouseCoopers, 67% of manufacturers surveyed are currently implementing 3D printing either in full production or pilot and another 25% intend to adopt 3D printing in the future. Which markets do you see the most potential in? Is 3D printing a tool for the developed world or could it take off in emerging markets? I think it matters to both. Certainly much has been made about the return of manufacturing to the US, but countries like China are also excited about 3D printing’s potential to inject more creativity into their major industries. It even matters in emerging markets. Autodesk and the University of Toronto are leading a project where we’re experimenting with different ways of scanning limbs and creating customised 3D prosthetic socket models for use in Uganda. Likewise, which industries do you see the most potential in? We see the most promise in industrial manufacturing, particularly automotive, aerospace, and medical/dental. There’s seems to be a lot of enthusiasm and promise around 3D Printing - it’s been featured on shows like the Big Bang Theory and even David Hasselhoff is investing in 3D printing companies - but it’s yet to really take off in the public sphere. Why do you think this is? I think up until recently, it has just been inaccessible for businesses and consumers. We like to say we’re still in the Homebrew Computer Club days of the industry, but people expect it to be as easy as 2D printing. Fundamentally, that’s a software problem and we need to get to the point where users can print with one-click, but also access more advanced features where they need them. There are a huge number of 3D printing companies out there – especially on the likes of Kickstarter and Indiegogo – but is the market over-saturated without enough standout players? We see a lot of innovation in the market, across hardware, software, even materials. We also see projects that we’re not sure will be successful. But that’s healthy and necessary to drive the industry forward. Crowdfunding startups like Kickstarter and Indiegogo are great resources for entrepreneurs to gauge the market for their products and secure initial funding, and the VC community is starting to take notice. While a lot of companies seem focused on cost and build quality, do you think 3D printing manufacturers put enough thought into the software side of things? 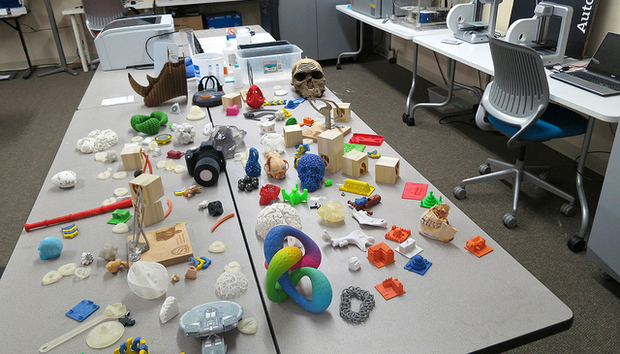 Could these companies be doing more to make it easier to actually design and print objects? It’s a great question. What we see is a lack of standards and core functionality that will make 3D printing successful across the full range of 3D printing methods and materials. That’s why we’re focused on solving the multiple points of failure across the 3D printing tool chain. Spark provides a common platform for 3D printers, and that will enable manufacturers to focus on their core competency of designing and producing 3D printers. We hope it will increase the ability for millions more people to create 3D prints from their 3D designs. Last year you launched the $100 million Spark Investment Fund. Why are you investing so much into 3D printing and what are you looking for in a partner? There is tremendous potential for additive manufacturing to revolutionize how we design and create things. Autodesk sees an opportunity—and need—to speed the pace of innovation in the 3D printing industry. We want to help make 3D printing more accessible and relevant by supporting companies that will contribute to the acceleration of 3D printing technology, and to make a valuable contribution to our Spark ecosystem. Autodesk also announced its first move into hardware with a 3D printer. Isn’t this fund helping potential competitors? Autodesk is designing the Spark platform to be open, so that any design software or digital model would be able to talk to any hardware. With our investment fund, we want to support companies that will contribute to the acceleration of 3D printing technology, and to make a valuable contribution to our Spark ecosystem. The benefit to Autodesk is that every 3D print starts with a 3D model, and Autodesk is the worldwide leader in 3D design software. Spark ultimately benefits our core business. There’s been talk of Autodesk and Spark becoming the “Android of 3D Printing.” Is this the plan, and what does that do for the company in the long term? There are many similarities. Although it serves mobile devices, Android is a software platform around which mobile device manufacturers were able to quickly innovate to offer significant consumer choice without making a major investment in the development of an operating system. We believe Spark will be similar in that it helps enable hardware manufacturers the opportunity to continue their development of cutting edge 3D printers and 3D printing technology without needing to make an investment in development of proprietary software or worry about industry standards and compatibility with all design tools. Just as Android has enabled new software and service providers to access mobile devices, Spark will provide an opportunity for material providers, software developers, and 3D designers to access the 3D printing workflow. If you were to bet on just two or three 3D printing companies [aside from Autodesk] becoming major players in the near future, which would they be and why? It’s honestly too soon to tell. Notwithstanding the industry’s history, we believe we’re still at the starting line. Do you personally have or use a 3D printer and how do you use it? At last count, we had over 50 3D printers at our Pier 9 office. I tend to use those, mainly for custom toys and creations. I have an eight year old who just loves Tinkercad.